Real Madrid could now fall 12 points behind Barcelona in La Liga, after getting beaten 0-1 by Atletico at the Bernabéu this Saturday afternoon. The Merengues struggled a lot against a very organized side and Zidane was handed his first loss as Real Madrid's first manager. Another derby in Madrid and another disappointing outcome for Real Madrid, who have lost 0-1 to their city rivals Atletico and are now also miles away from Barcelona on the top of the standings in La Liga. The only goal in this game was scored early in the second half, in a fast counter-attack play from the visitors that ended with Antoine Griezmann finding the back of the net and beating Navas to secure the 3 points for Atletico. The Merengues can now fall 12 points behind Barça if the Blaugranas beat Sevilla tomorrow night, but they are already 4 points adrift of Atletico with 12 fixtures left to be played in Spain. 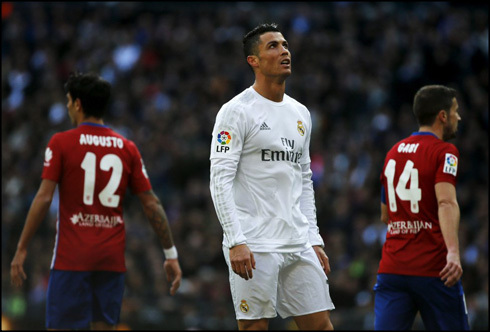 Real Madrid's underwhelming La Liga campaign met yet another obstacle this afternoon, as they lost the Madrileño derbi by a score of 0-1. It was yet another game against a big team and another tie/loss for Madrid, as city rivals Atletico put some separation between the two challenging teams and now go 4 points on top of the Merengues. 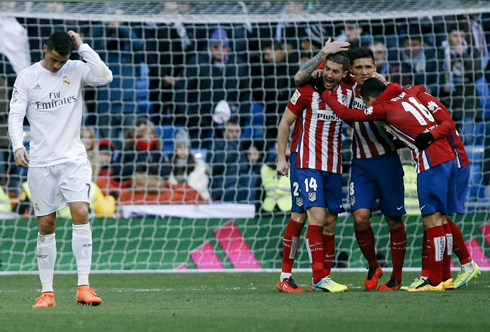 Real Madrid weren't entirely poor and Atletico certainly are a formidable threat, but generally speaking, Madrid just can't seem to get to the next level against good opposition. 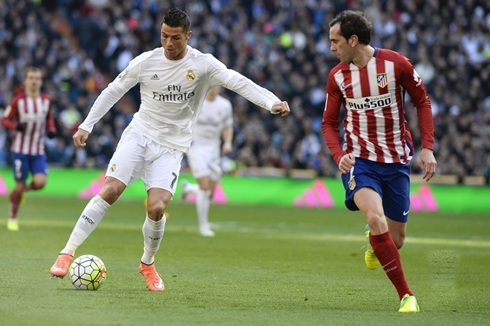 It was again a series of poor crosses and no imagination in the final third. Despite heavy possession, Madrid couldn't break through, making it their 6th straight derby game againt Atletico without a victory, a disastrous record that has now spanned the tenure of three coaches: Carlo Ancelotti, Rafa Benitez and now Zinedine Zidane, who loses his first game as Madrid coach. Atletico's talisman Antoine Grizemann, was the hero for Atletico, with his tidy finish early in the second half proving to be enough. 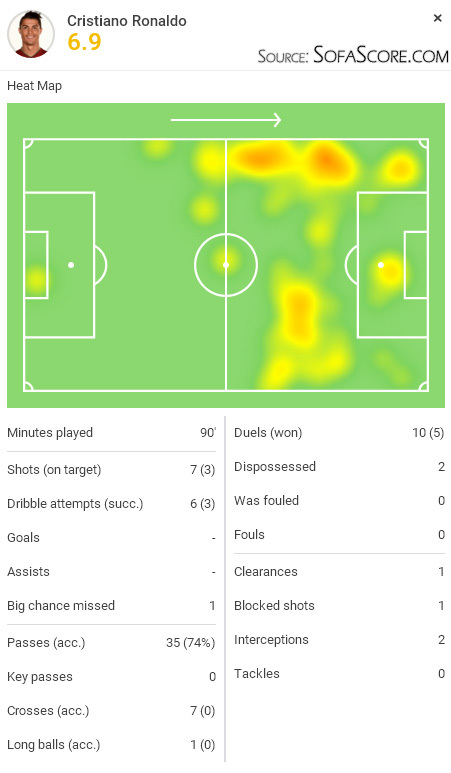 Danilo, deputizing at left back for Marcelo, was actually quite good today but without Gareth Bale and James' poor current form, Real Madrid never truly threatened. There were a few chances for Cristiano Ronaldo too. His downward header in the second half should have given Oblak more of a challenge, but ultimately, there were no goals for him in yet another frustrating game against a top opposition and an extremely well organized side. 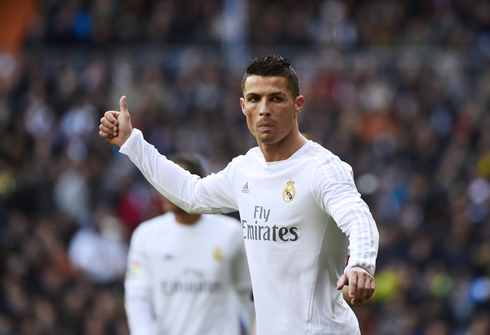 Real Madrid now risk going a full 12 points behind Barcelona if the Catalans beat Sevilla this Sunday night. 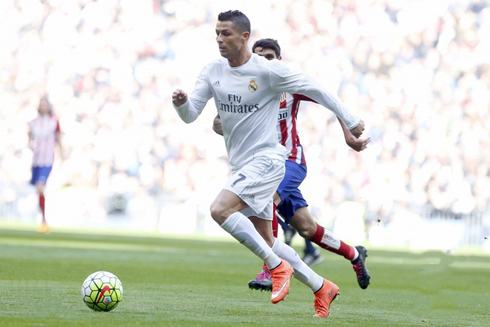 Cristiano Ronaldo next game will be for Real Madrid for La Liga, on the 2nd of March of 2016, against Levante. You can watch Juventus live stream, the Levante vs Real Madrid, Barcelona vs Sevilla, Manchester United vs Arsenal, Tottenham vs Swansea, and Liverpool vs Manchester City, all matches provided from our football streaming game pages.